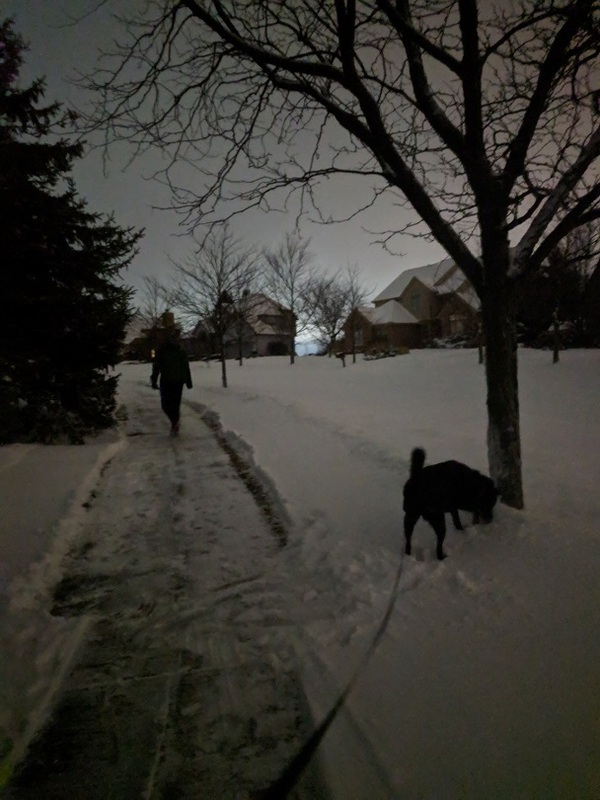 It was over 30 degrees two nights ago, so we went for a night walk after your mommy spent another hour clearing snow. I have been really tired at night, mostly due to clearing snow and the cold. I'm going to write to you in the morning. You would love this weather. Maybe not today since it's arctic temps, but you do love snow and cold weather. It is freezing here, may be too cold even for you. Your sister and I have not been able to be outside more than 15 mins at a time. I know she wants long walks and we will take her this weekend. The weather this weekend is supposed to be unseasonably high. Definitely global warming. Yesterday I got a kids book that is titled "Always in My Heart" Not only does that describe you and me, the cover has two foxes on it. I always tell people you look just like a fox. Still freezing here, and I really mean freezing. Your sister is very bored, I will take her for the loop tomorrow. And over the weekend your daddy and I will take her for long walks. I don't refer to you in the past tense. You are still my baby and a member of our family. We love you so much. I just took your sister for a loop, my ears are freezing. It's double digit above zero and sunny but still freezing. Your mommy will never get used to it. Your daddy is still very busy at work, all the way through next week. Then it will become just busy, not super busy. I am trying to be optimistic about my job search. It is not easy despite the jobs number report. My nature is cautious and I'm focused on security, which means my first thoughts are commonly doubt and why something wouldn't work. I have been charged with this new exercise of whenever I think of something negative, write down a positive. Interesting. I saw a video of a Finnish Spitz playing in the soft snow and barking. Whenever his face was not in the snow he was barking. You guys just love snow. Starting yesterday it has been unseasonably warm. 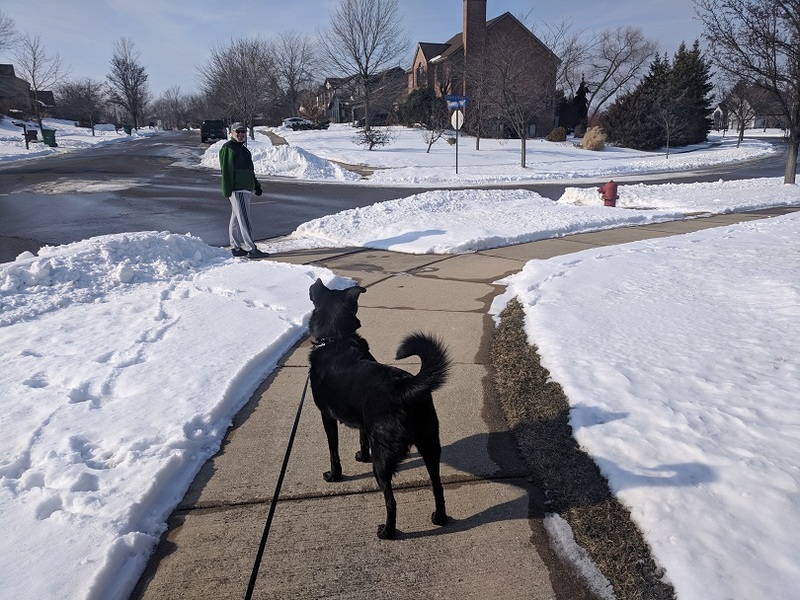 Your daddy and I took your sister for long walks yesterday and today, it was very nice to walk, get fresh air, and get vitamin D. It is still icy in some areas and there's still lots of snow. I will post some pictures soon. We also took your sister with us to a local hangout today. We think we enjoyed it. We are at your other mommy's house right now. The game is on but no one is watching. I miss you. Everyday. All the time. Our family will never be the same. Here is what I was talking about. 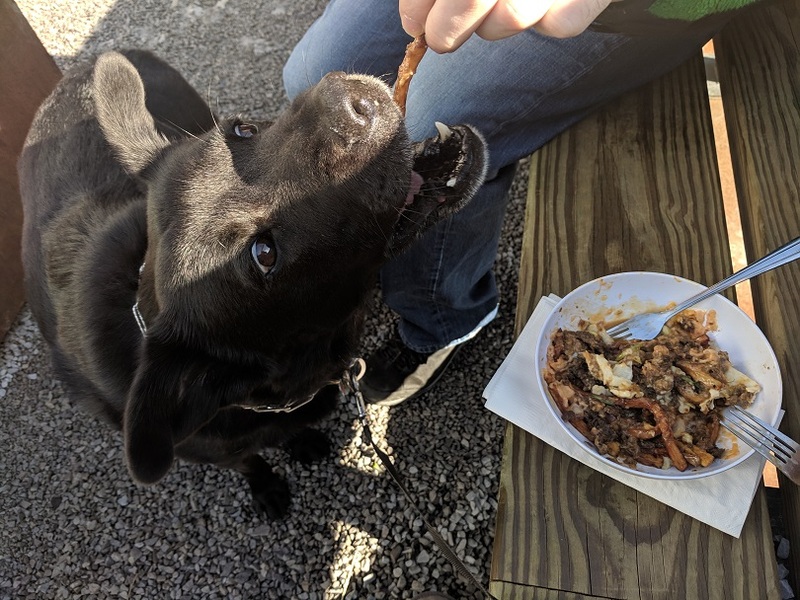 You would love those fries. I took your sister on an extra long walk today. She needs to lose weight. I know eating cheese fries doesn't help. I had a good phone call with an organization today. Really hoping to start working in a month. There are a number of things I hope for, that is one of them. Maybe not surprisingly, it's not the top one. I still see you around the house Puds. I still wait for you to come around to the room we are hanging out in, or to be outside our bedroom guarding us while fluffing your blanket, or eating and walking next to your sister. It's Chinese New Year today, Year of the Pig. Yep, the same thing we call your sister. Your dad is still very busy, through this week, then just plain busy for who knows how long. Months? Rest of this Year? I have a lot on my mind. I'm worried about the usual. Not having you around colors everything though. Time is going slow. It feels like you have been gone longer. I miss you so much and I am so sad you are gone. Icy here again. No long walk today. We will still go for an afternoon one though. You know what's strange. I have been looking at lots of pictures of Finnish Spitz. They are all adorable of course. But their images are starting to mix with yours in my mind. I know what you look like, feel like, I can still see your beautiful eyes, ears, paws, your glorious tail, your belly. It has not even been three months since you have been gone. Time is going very slow for me. Another icy day here. I took your sister for the loop and it took a long time not only because she likes to linger and backtrack, but also because I cannot walk very fast. You know I am always afraid of slipping. I will never get used to the weather here. We miss you so much. Time is going slow. I am working on and dealing with some big things. Besides finding a good job. I will tell you more later. 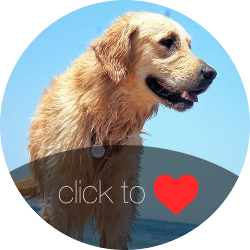 All your letters to your sweet doggie are beautiful. My eyes are flowing with tears. I guess you say it's been 3 months and I want to say how deeply deeply sorry I am. I hope at this time you are coming along a little better . It's just so very difficult beyond words. Prayers for you and your Pud Pud. Thank you so much for your kind words, they really made my day. Time does help and I do feel better, it is bittersweet though because each new day is another day without Puddy. I want him to know how much his family loves and misses him and what we are up to, and writing to him is the only way I know how to keep him up to date. I saw your picture of Henry. He was a beautiful cat. I am sorry for your loss as well. I am grateful we had such wonderful companions who loved us so much. Best to you and your family. You're very welcome and thankyou on Henry. More doctor visits and phone calls for your mommy today. I have now seen three doctors and I think that is enough. Your daddy and I will decide what to do from here once we know the costs. It's not that easy to determine costs so we have to be careful and confirm things. Weird how that takes up 1/3 to 1/2 of my days now. Very windy outside and very cold. No long walk for your sister, which we both miss. It is February after all. You may enjoy outside right now, you have always liked cold weather. And we have more snow coming. Your other mommy is coming tomorrow. She misses you very much too. I am working on something in your honor. I am going to do my best, of which getting over the fear is a big part.